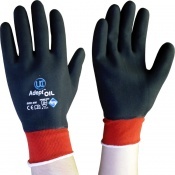 The Adept Ultra NFT Nitrile Knuckle Coated Gloves feature patented NFT® knuckle coating on a flat, hardwearing yet flexible, nitrile undercoat provides a waterproof glove with exceptional grip in wet and oily conditions. The close fitting style of the Adept Ultra NFT Nitrile Knuckle Coated Gloves offers complete control further enhancing grip and dexterity. NFT® coating on the Adept Ultra NFT Nitrile Knuckle Coated Gloves provides class leading abrasive resistance to offer an extremely long lasting glove and, with the Sanitized® hygiene function, is able to stay fresh and odour free throughout usage. 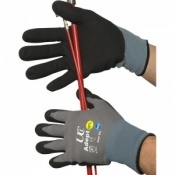 The Adept Ultra NFT Nitrile Knuckle Coated Gloves features a fully coated flared cuff protects the wrist area and allows for easy donning and removal.